Waving is a friendly gesture except when it is a piece of fiber art on a wall similar to a painting. 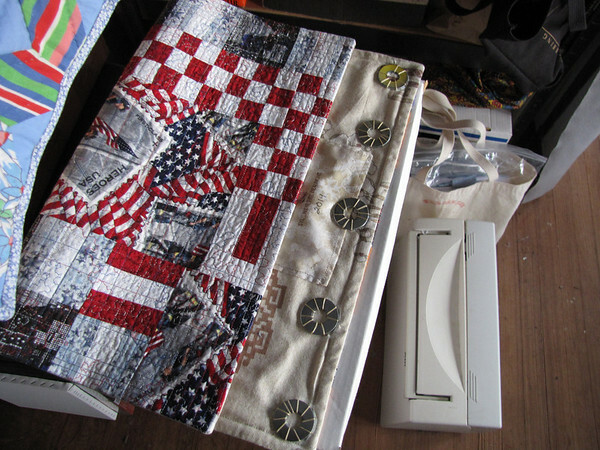 Curtains flutter but quilts should not. Maintaining a flat surface can be illusive but I’ve devised a plan to make the smallish pieces I make hang flat. Most of them are quite heavy as I use canvas as my “batting” and then a piece of commercial drapery fabric as the backing. This fabric is more light fast than quilt cottons are although why I should be worried about something that faces the wall is not something I’ve contemplated. However, all that stiffness does make a piece hang nicely. 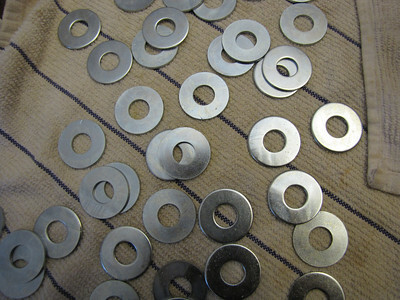 I’ve also begun sewing washers to the bottom of each piece. These are 1/2–I don’t know how washers are measured; I just go to the local hardware store and describe what I’m doing and what I want it for—and the nice man very politely helps me select out a box. Then I rinse them in a bowl of sudsy water and sew them on with carpet/upholstery thread.